This simple vegetarian supper is full of fresh early-summer flavours, including delicious new-season asparagus. Cook the spaghetti in boiling water, according to the pack instructions. Meanwhile, place the asparagus in a steamer over the spaghetti for the last 4-5 minutes of cooking time, and steam until just tender. Place the crème fraîche in a small pan and add the garlic and lemon zest. Simmer gently for 2 minutes, then season. Drain the pasta, reserving about 3 tbsp of the cooking water and return the pasta to the saucepan. Stir in the asparagus, crème fraîche mixture and pine nuts. Add the rocket and reserved cooking water and stir until the leaves are slightly wilted. Serve immediately. You can toast pine nuts yourself in a hot frying pan for 2-3 minutes, turning all the time until golden. 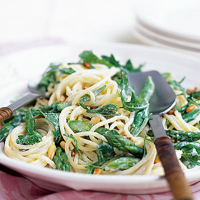 Spice up this pasta dish by adding a good pinch of dried chilli flakes to the crème fraîche sauce.